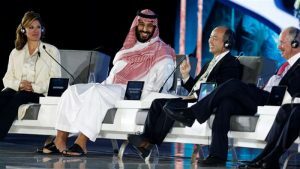 Crown Prince Mohamed bin Salman said in an interview published Monday that Iran’s supreme leader is more dangerous than the former German ruler Adolf Hitler, in a rhetoric which confirms the cold war between Saudi Arabia and its regional rival Iran. Answering questions in a lengthy interview with The Atlantic’s reporter Jeffrey Goldberg, the heir of the Saudi throne equated Ayatollah Khamenei, the Iranian supreme leader, to Hitler. “I believe that the Iranian supreme leader makes Hitler look good,” he told Goldberg. “Hitler didn’t do what the supreme leader is trying to do. Hitler tried to conquer Europe. This is bad,” he added. The Crown Prince also laid into the Iranian regime for failing to meet the needs of the Iranian people despite its return into the international community through the 2015 nuclear deal signed with world powers. “The economic benefits of the Iran nuclear deal are not going to the people. They took $150 billion after the deal—can you please name one housing project they built with this money? One park? One industrial zone? Can you name for me the highway that they built?” he said. The Saudi young royal placed Iran in the Triangle of Evil alongside the Muslim Brotherhood and extremist jihadist groups including al-Qaeda and the Islamic State group. Saudi Arabia and Iran have been in proxy war for the control of the Middle East region. The two countries have accused each other in the Yemen conflict which erupted three years ago. Riyadh accuses Tehran of funding and equipping the Houthi rebels opposed to the Saudi-backed government of President Mansour Hadi. Written by: KanelkaTagba on April 3, 2018. Posted by KanelkaTagba on Apr 3 2018. Filed under Gulf News, Headlines. You can follow any responses to this entry through the RSS 2.0. Both comments and pings are currently closed.